The owner of 911 Restoration Metro East, Brian Hernandez, has over 30 years of fire damage restoration. To him, “the work is about the people. I radiate happiness, and I love bringing it to residents who need it the most after they experience an accident,” he explains. He believes that customers need a team that is licensed, insured, and bonded because a professional team is the only type of team that can turn disorder into order. Your fresh start begins when you call us. Our remediation skills will make your life better, and we will guide you to future that is smoke damage free. 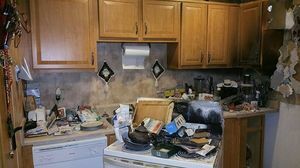 If your home has recently undergone a fire and smoke damage situation, then don’t hesitate to contact Bill and the fire and smoke damage Belleville team with 911 Restoration Metro East Today! “Fires can sometimes happen from really obvious things like a cigarette, but for the most part they are freak accidents. You just never know what may start a fire. The most recent one I saw was one where a cellphone battery shorted, causing the curtains it was next to set ablaze,” Brian says. This is why we wanted to compile a list to get homeowners ready for a fire, so that they may curb damage and save yourself from bodily harm. Practice a fire escape plan, so that in the event of an emergency your panic will not get in the way of escaping safely. Buy smoke detectors in order to alarm you when a fire starts. A fire extinguisher is great for fighting small fires, for bigger fires evacuate the home. Your safety is the number one priority. Leave space heaters three feet of clearing on each side to prevent it from catching something flammable on fire. Other flammable objects, such as hairspray, should be kept in a cool dark space to keep from combusting. Furthermore, things such as wired electronics should be inspected for frayed or exposed insulation. Moreover, wires should not be ran over carpets, or behind couches. Make sure to keep sockets from having too many appliances connected them, as an overload could be dangerous. If you do experience a fire, do not worry because 911 Restoration’s fire and smoke damage restoration Metro East team can take care of you. 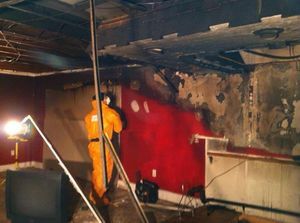 When you call us, you are calling a fire damage restoration team that is IICRC certified. It is important that you have someone by your side that can fix the most severe hardships you are experiencing. For example, after a fire is extinguished your worries are still not over because ash, soot, and water remains. We want you to know that we have your back. 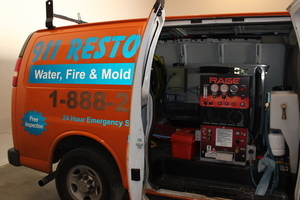 Our knowledgeable technicians are capable of remediating any situation, in order to bring you back to balance. Ash and soot are carried by smoke and deposited into walls, upholstery, floors, and vents, where they can produce odors if not removed. We use our wet vacuums to get water out of your home. And then we use surface-penetrating chemicals to deep clean surfaces in order to refreshen your home, so you can begin enjoying it sooner. We know you need help, fast, so it our guarantee that when you call us we will be there within 45-minutes with same-day service 24/7/365. If you are in need of a fresh start call us for the best service around.